Two wedge-shaped pieces of cartilage act as “shock absorbers” between your thigh bone (femur) and shinbone (tibia) called as Menisci. If the meniscal tear is small and on the outer edge of the meniscus, and your knee is stable, it may treated conservatively with rest and pain medication. If symptoms persist then thet are treated arthroscopically. 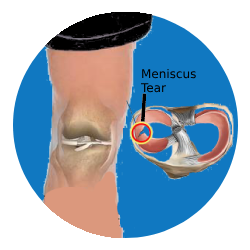 Partial meniscectomy – The damaged meniscus tissue is trimmed away. This requires approximately 3 to 4 weeks for healing. Meniscus repair- can repair meniscus tears by suturing the torn pieces together .This may take about 3 months to heal.